Sweet and Spicy Orange-Scented Nuts are a delicious homemade holiday gift, addition to a cocktail party spread, or anytime snack. With the holiday season upon us, this month’s theme for The Recipe ReDux is Adding Merriment to Mixes, which challenged us to come up with DIY offerings from our kitchen. Whether for hostess gifts or holiday gifts, there are lots of homemade mixes – and adorable packaging – you can make. Some popular mixes I’ve seen over the years are cookie or pancake mixes in a jar, spice blends, and soup mixes. These are all such fun gifts to give, especially as we head into a new year and people are trying to eat healthier. What better way to help your friends out than give them some healthy food?! I also love cooking and baking with spices – cinnamon, ginger, chili powder, cumin, and coriander are just a few of my favorites and can be found in some of my other recipes like Moroccan-Spiced Lamb Burgers and Healthier Pumpkin Pancakes. These orange-scented nuts are made with a handful of spices, some of which add some heat and some are flavorful and warming, which is a perfect combination for the cold winter months and holiday season. One thing to note about using spices is that the end result isn’t necessarily spicy. Some spices like chili powder, paprika, and cayenne pepper will add a kick to your dish, but many of the spices I use when cooking are warming spices, which add a nice depth of flavor without any heat. Orange is one of my favorite fruits to cook with in the winter months – I add fresh orange juice and zest to my Orange-Ginger Cranberry Sauce, a favorite at Thanksgiving, my Cranberry Orange Bread, and my Iced Orange-Cranberry Biscotti. Fresh oranges are the star of the show in my Citrus Fennel Salad, my Orange Maple Salmon is an easy, nutritious and delicious main course, and an Orange French 75 is a great addition to the cocktail list for a holiday party. The first step in making these sweet and spicy nuts is to coat them in a wash of egg whites, freshly squeezed juice, and freshly grated zest – those orange accents go a long way in the flavor department. You could just as easily skip that step and coat the nuts in the spices, but I assure you the orange essence will be missed. If you want to keep these vegan you can eliminate the egg white, but I find the addition of the egg leads to a crisper nut. Once the nuts are coated in the orange egg wash, toss them with the sugar, salt, and the rest of the spices. Spread them in one layer on a baking sheet and bake until they’re lightly toasted, then toss with some dried cranberries for a touch of added sweetness. These are not a sticky caramelized nut like candied nuts you may be familiar with, so don’t expect to get that end result (there’s only 2 tablespoons brown sugar in the whole recipe). These Sweet and Spicy Orange-Scented Nuts are a great addition to salads (like this Winter Root Vegetable Salad), grain dishes (like this Spiced Quinoa), a cheese plate, and of course they’re delicious on their own. Set out a bowl at your next cocktail party and I assure you they will disappear! Preheat oven to 250 degrees F. Line a baking sheet with foil and spray with nonstick cooking spray. Set aside. In a medium bowl, whisk together the orange zest, orange juice, and egg white. Stir in the pecans and almonds and toss to coat. In a small mixing bowl, whisk together the sugar, salt, and remaining spices. Add to the nut mixture and toss to coat all nuts. Spread nut mixture in a single layer on the prepared baking sheet. Bake on the top rack of the oven for 40 minutes, stirring occasionally. Remove from the oven, stir in cranberries, and let cool. Transfer to storage or gift containers. 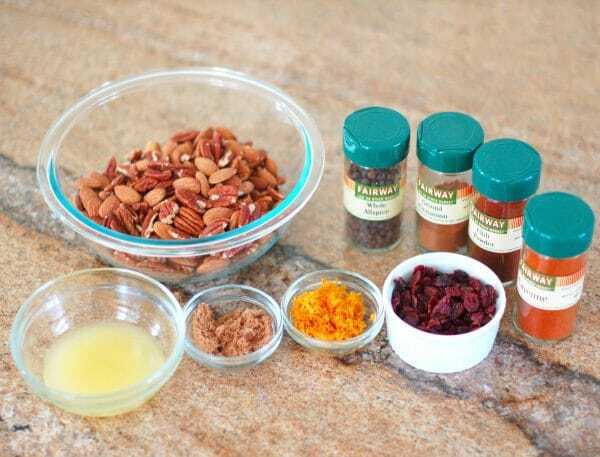 Have you ever made your own nut mix? Do you make your own foodie gifts for friends and family? yum…. i’m sure they smell divine too! Thanks – they do!! Love all the smells in the kitchen this time of year! 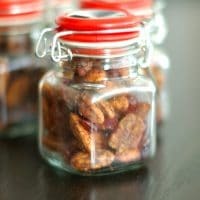 I just love the addition of orange zest to give it a unique twist on tradition spiced nuts. Yum! Thanks Jaime – as you know, zest can do a lot for a recipe!! Hey you did well at Michael’s! (: All the little jars are adorable. 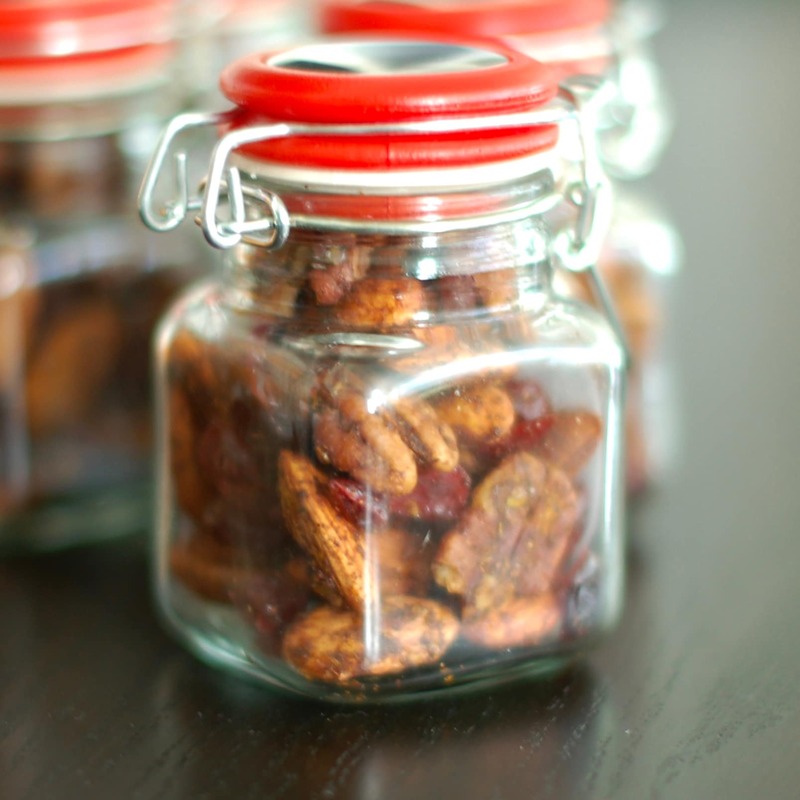 And of course I could eat spiced nuts daily – so will be making these for sure! Thanks Serena!! It was the stickers that were so hard to find!! That store is amazing!! Yes please!!! Yes, to the yummy nuts! 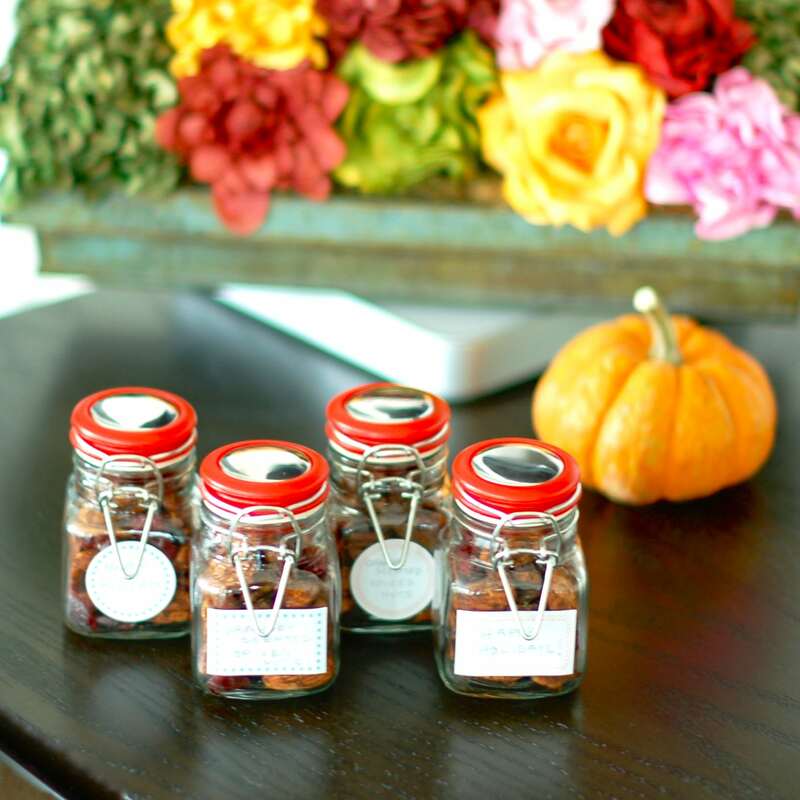 Yes to the adorable jars! Yes to your gorgeous floral arrangement in the background of the first photo!! Great ReDux Jessica!!! Great minds! I love citrus zest and the pecans in this mix. You should!! I have been snacking on them all week! Any idea how long can these be stored? Candi, if they are stored in an airtight container they should be good for a month or two (if you don’t eat them all first!!). You can also store in the freezer for longer. Awesome! Just what I wanted to hear! Thanks Rachel. Let me know if you make them! These would have to be at every corner in my house so I could grab then at all times! I don’t blame you…whenever i make a batch I put them in bowls in various parts of the house! 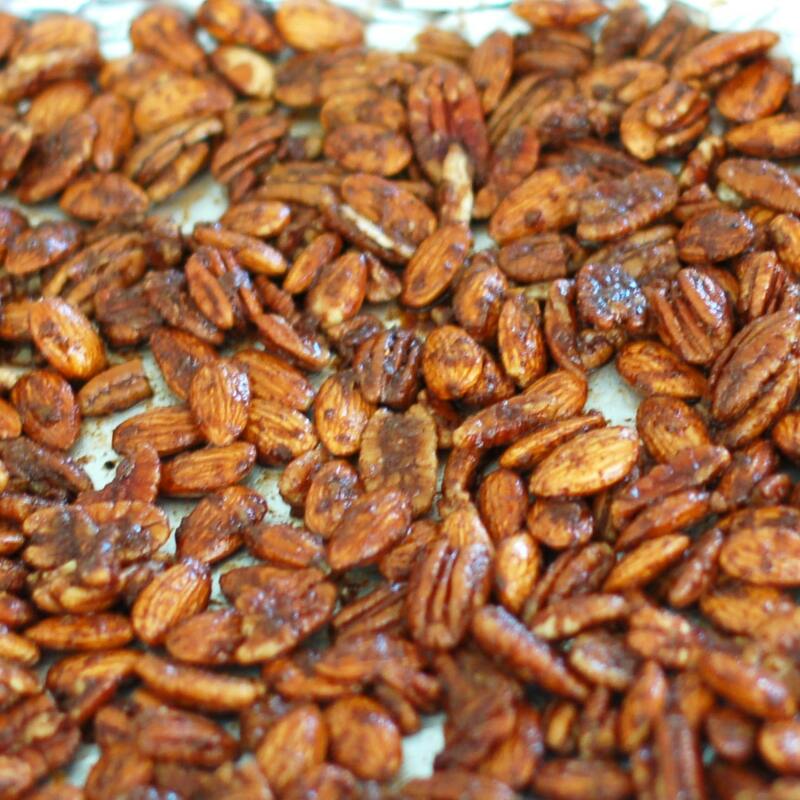 I make so many spiced pecans over the holidays for gifts. Can’t wait to add the orange flavor to them! They’re such an easy and yummy gift. Would love to hear how you like the orange addition! I love making candied nuts, but haven’t ever added orange into the mix. These sound like a great homemade gift or treat to have around for snacking! Thanks Tara. Hope you try adding the orange next time!